Very Good. Trade paperback (UK). 384 p. 'TIMELY AND IMPORTANT' JIM AL-KHALILI In Our Own Image by Dr George Zarkadakis explores one of humankind's oldest love-hate relationships-our ties with Artificial Intelligence or AI. its connections to neurology and consciousness, as well as-perhaps most tellingly-what AI reveals about us as human beings. New. 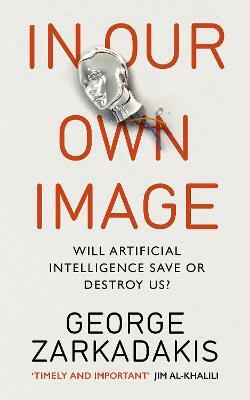 Explores one of humankind's oldest love-hate relationships-our ties with Artificial Intelligence or AI. This book traces AI's origins in ancient myth, through literary classics such as Frankenstein, to today's sci-fi blockbusters, arguing that a fascination with AI is hardwired into the human psyche. Num Pages: 384 pages. BIC Classification: HPX; PDR; PDZ. Category: (G) General (US: Trade). Dimension: 217 x 136 x 29. Weight in Grams: 410. 2015. Paperback.....We ship daily from our Bookshop. New. Trade paperback (UK). 384 p.